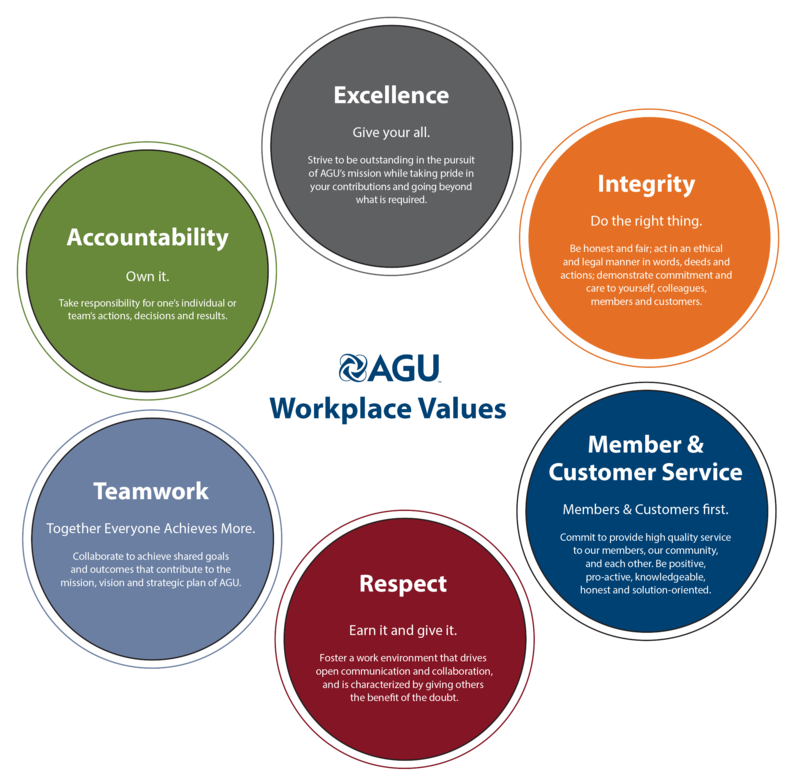 At the American Geophysical Union (AGU) we value teamwork, innovation, excellence, and transparency. We’re at the center of exciting scientific advancements and are looking for curious, resourceful, and collaborative individuals to join our growing team. 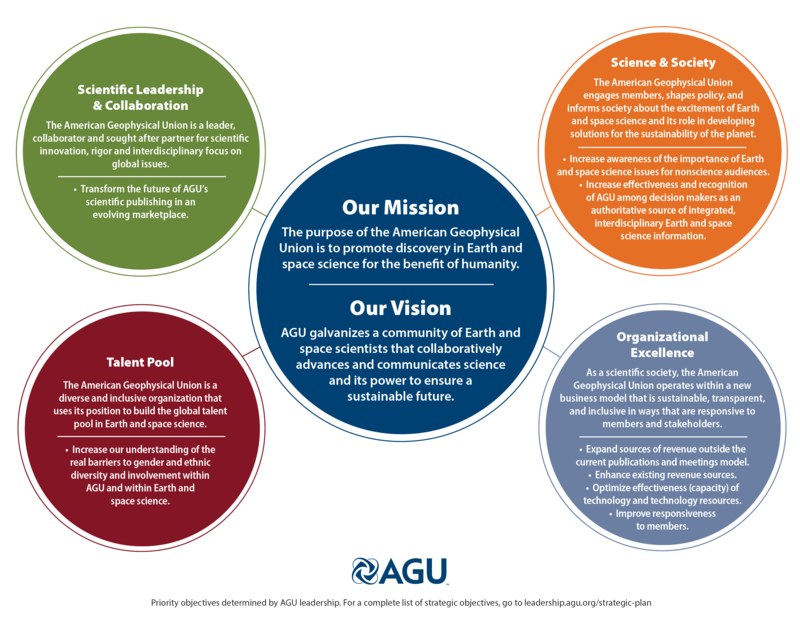 Serve Our Mission The purpose of the American Geophysical Union is to promote discovery in Earth and space science for the benefit of humanity. Make An Impact Working at AGU is more than a job; you can make a difference. You’ll have the opportunity to share your creative ideas and put them into action. 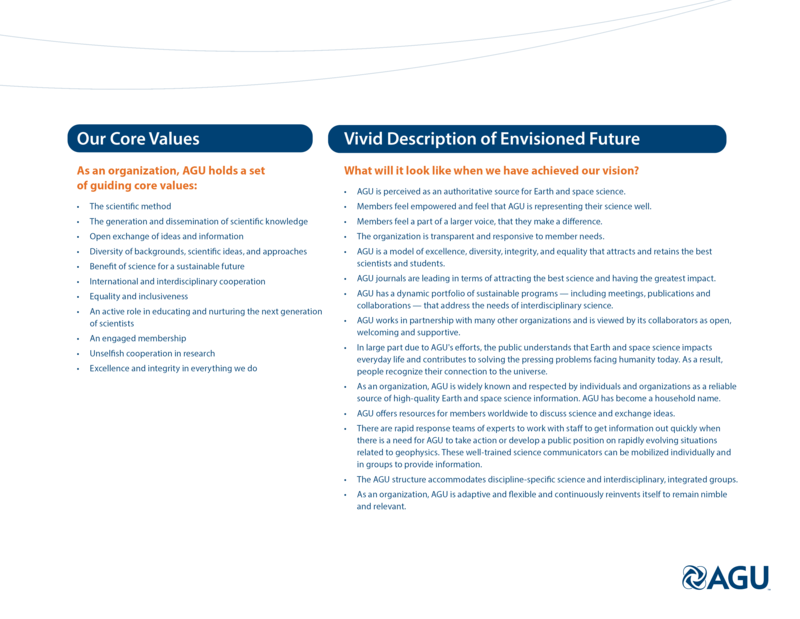 Realize Our Vision AGU galvanizes a community of Earth and space scientists that collaboratively advances and communicates science and its power to ensure a sustainable future. Working at AGU is more than a job; you can make a difference. You’ll have the opportunity to share your creative ideas and put them into action. AGU is a not-for-profit, professional, scientific organization representing nearly 60,000 members in 139 countries. AGU is dedicated to advancing the Earth and space sciences to achieve a sustainable future for humanity through its scholarly publications, conferences, and outreach programs. This is an exciting time to work at AGU. Every day we approach our work with a sense of purpose, and we look for others who share that passion, and desire for a career with impact. Life happens and we understand that. Have a work-life balance with flexible hours. Medical, dental, life Insurance, disability coverage and flexible spending accounts - we've got you covered. Tuition support and retirement plans help you secure your future. Participate in ongoing training offered on a variety of topics, including project management. Attend conferences in your field and related fields to keep in touch with new trends and grow your expertise. Enjoy monthly social activities to connect with your co-workers and give back to the community. At AGU we are looking for individuals who want to learn something new every day, who welcome a challenge, and are motivated to achieve results in a fast-paced environment. Our ideal candidate is a proactive and creative problem solver who enjoys collaborating across diverse teams. You will feel welcomed and supported from the moment you join our team, and will take part in strengthening and evolving our workplace culture. We’re working to advance science for the benefit of humanity and want each of our employees to know that they are an important part of supporting that mission.